Disclosure: This post is in partnership with Tide. Content and opinions are my own. I had a pretty relaxed day on the grill, up until the last hour. That's when it started pouring just as the ribs were done. It was a mad dash getting my equipment back inside and dinner served, all while chasing a toddler, arguing with a teenager, and snapping those last critical photos. The life of a food blogger, gotta love it. Speaking of hectic routines, there's a side to grilling that is frankly still a pain to me, and that's the mess. By the end of your time on the grill you will most definitely be sweaty and smelling like the inside of a charcoal pit. Every dishcloth, glove or apron you touched will be smudged with soot or grease. 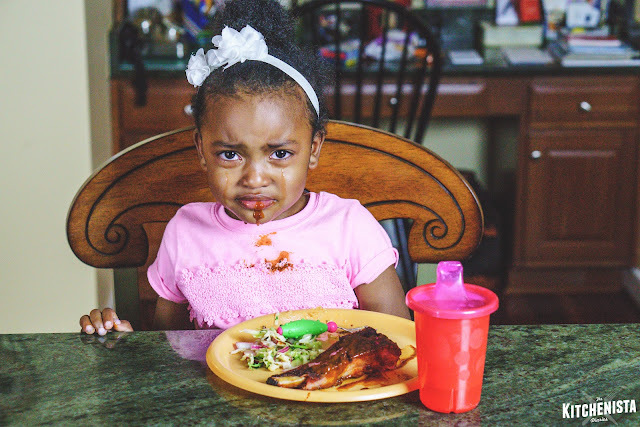 Kids covered in barbecue sauce (Raven wasn't happy about that at all!) Good times. Laundry is the only thing I despise more than the dishes, but there's no escaping it on grill nights. This section contains affiliate links. My household has recently switched to Tide PODS®, a 3-in-1 laundry solution that consists of a detergent, stain remover and brightener all in one. 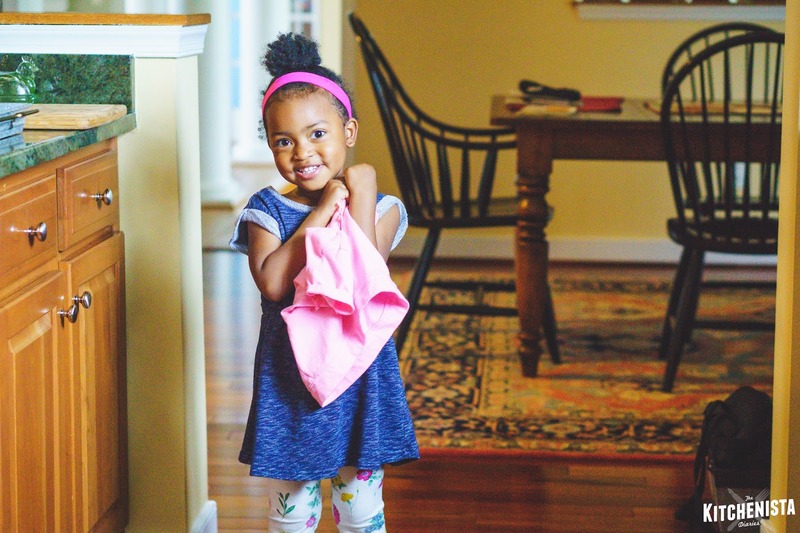 It's a change that has made things easier in our busy family's laundry room. The messy and often wasteful routine of measuring detergent is now a thing of the past. I was skeptical that compact detergent pacs could thoroughly get out barbecue stains and tackle the smell of smoke, but I've been pleasantly surprised. Each load genuinely comes out smelling fresh, even the dirtiest grilling towels. 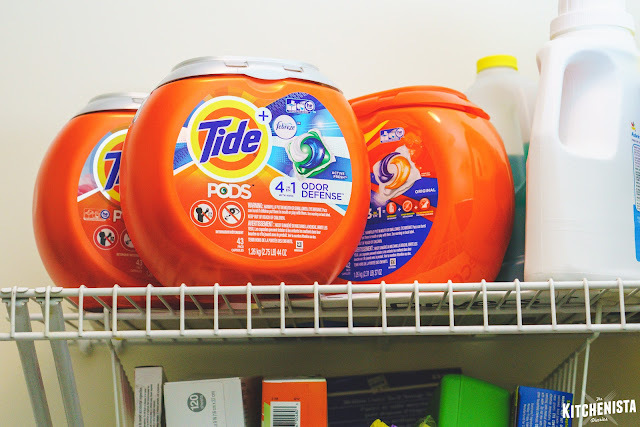 I will never love to do laundry, but I appreciate that Tide PODS® is a #smallbutpowerful solution to make my grilling routine a little easier. It came as no surprise to me that Raven was looking for her clean shirt first thing in the morning. Luckily, Tide got the job done last night, so the crisis was averted...for now. The leftover ribs I packed for her lunch might say otherwise! So about these ribs. 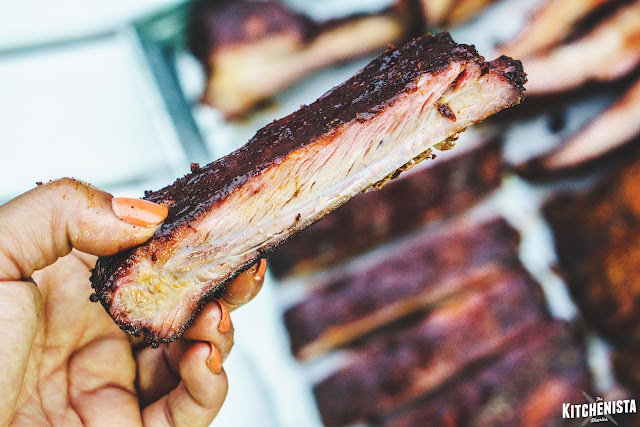 My go-to formula for ribs has been a coffee-chile rub paired with my guajillo cherry bbq sauce, but that wouldn't work here. Memphis style is more in line with a classic paprika bbq rub; the optional sauce, tomato-based and not very sweet. I chose to stick with my own traditional bbq rub recipe, which is heavy on the smoked paprika. 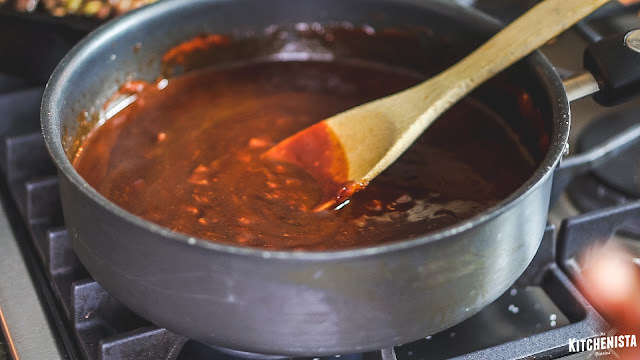 I then went back to one of my earliest homemade bbq sauce recipes, before I started getting crazy with dried chiles and fruit. I kept the framework of that basic sauce, dialing back on the sugar. My sauce utilizes canned seasoned tomato sauce, something I've always done to avoid ketchup. The main difference between the way I've been smoking ribs and Memphis' version is the addition of a mop sauce to moisten the ribs, attract smoke, and encourage caramelization (so they say; seems to be a debated practice.) Nevertheless, I opted for a very simple mix of apple juice, cider vinegar and my bbq rub. Those of you begging for new videos will be excited to see that I captured moments from my adventures on the grill today! 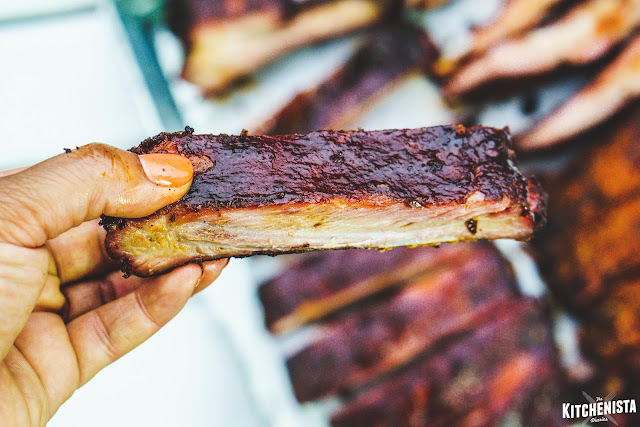 You can view that here, and grab my recipe for Memphis Style Ribs below. Prepare so that your ribs will have at least four hours in the fridge after being seasoned. In my experience, results with ribs are disappointing when the salt doesn't have time to penetrate the meat. Pull off the thin membrane on the backside of the ribs. It should come off in one sheet if you tug from the end, but worst case, use a sharp knife to carefully score in between the ribs and remove the membrane in sections. 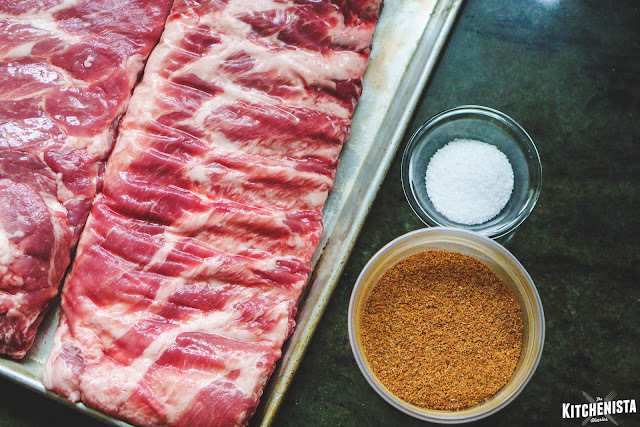 Measure out 2 tablespoons of Kosher salt and rub it into the ribs, concentrating on the meaty side. Mix together the sugar and spices for the bbq dry rub. Measure out 6 tablespoons and set the rest aside so as not to contaminate the container. Season the ribs liberally, rubbing the spices into the meat. Shake off excess rub and discard. 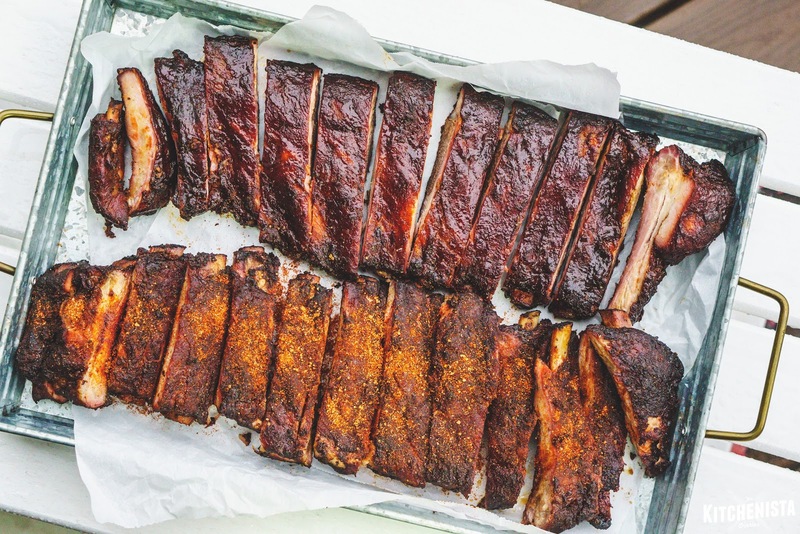 Refrigerate ribs on a clean pan, wrapped in foil, for a minimum of 4 hours, up to overnight. I didn't like the texture of the meat as much after leaving the ribs to sit for a full 24 hours, so I wouldn't do this too far ahead of time. Prepare your charcoal grill for 2-zone cooking, or light a smoker per manufacturer's instructions. Below is the setup I use for a Weber kettle grill. I'm a fan of using a chimney starter for lighting the charcoal. I add about a chimney full of unlit coals pushed to one side of the grill with a water pan on the empty side. I light a half chimney full of coals and once the coals are white hot I dump them out on top of the unlit coals. I threw in a couple chunks of hickory wood. Then I close the grill and let the temperature stabilize, which takes ten minutes or so. On our grill both the intake and exhaust dampers need to be just barely opened to maintain the temperatures between 225°F and 250°F, ideal for slow smoked ribs. 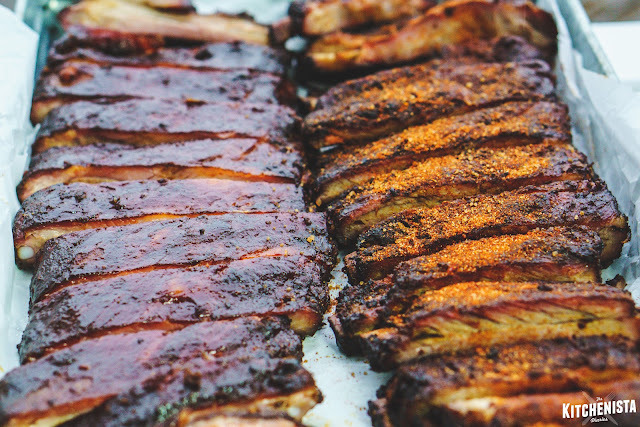 Oil the grates and place seasoned ribs down, meaty side up, on the cool side of the grill. If you have them, rib racks can be used instead of placing ribs directly on the grill. I think they're helpful in small spaces so that you don't have one rack too close to the hot coals. 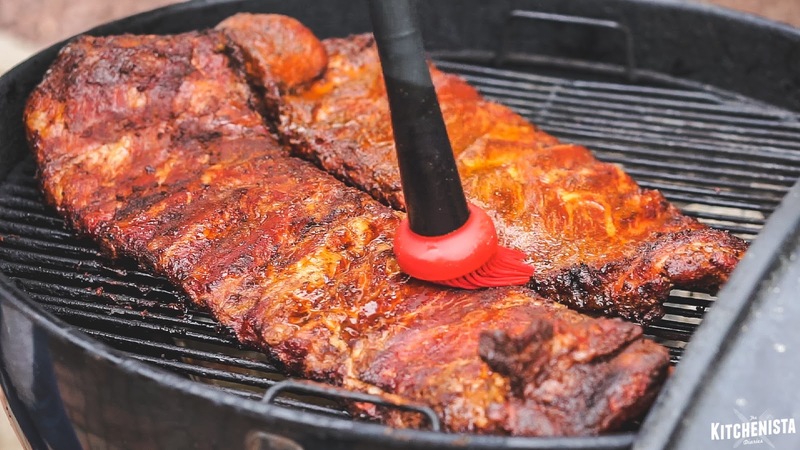 However, I switched back to placing them directly on the grill after the ribs shrank and I had more room, which was easier for the mopping process later on. Cover grill, positioning the lid so that the exhaust damper is over the ribs. Smoke for 2 hours, maintaining the temperature of the grill. In the meantime, prepare the mop sauce by combining the bbq dry rub, apple juice and cider vinegar in a jar. Cover and shake well to distribute the spices. After the 2 hour mark, rotate the ribs' position. The ribs should by now have taken on a rich color and slightly crusted outer appearance. Mop the surface of the ribs generously with mop sauce. Cover the grill again. Repeat the mop every hour until the ribs are close to being done; most likely 5 to 6 hours total for spare ribs, but it could be more or less depending on the size of your ribs. Always get in and out as quickly as possible; every time the grill is opened you're letting air in which will cause the coals to get hotter. Alternatively, if the grill drops below 200°F, you may need to add a few hot coals at a time until the temperature is stabilized again. 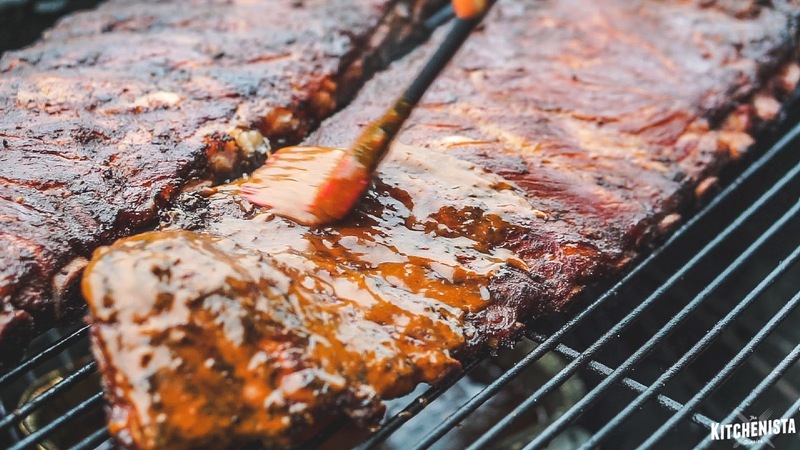 While the ribs are smoking you can prepare the bbq sauce if you plan on using it. Simply saute the onions in melted butter over medium heat. Add the garlic and spices, followed by the remaining ingredients. Simmer for 5 minutes and allow to cool slightly before blending until smooth. You can adjust the measurements to your liking; remembering it's not intended to be a super sweet sauce. 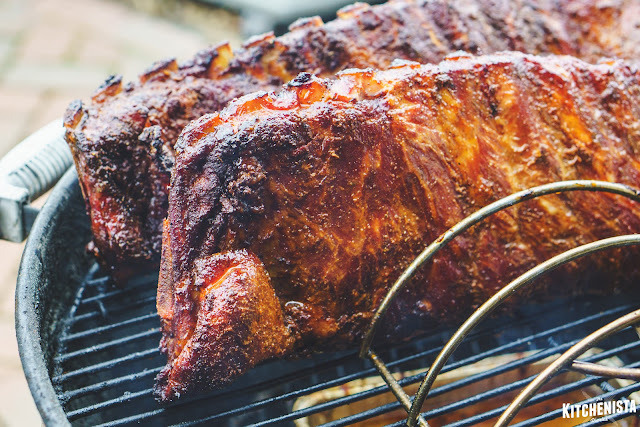 With experience, you'll find it easier to tell when smoked ribs are done. A knife should be able to glide through the thicker parts of the meat easily. For spare ribs I'll start checking around 5 hours. Another way I check is by twisting a couple bones to see how easily they move; when ribs are ready, the bones feel like they could slide out of the meat with just a little bit of resistance. I read that the mopping process extends the smoking time, and that seemed to be the case here for me as well. I believe the total time ended up being just shy of 6 hours, about an hour longer than usual. If you'll be saucing a rack (or both), wait until the ribs are about 30 minutes shy of being pulled off. Baste the ribs in 10 minute increments, covering the grill in between. I like to open the grill to let the charcoal heat up slightly in the last few minutes, to get that nice caramelization of the sauce. After the ribs are ready, transfer them to a clean pan and rest for at least 15 minutes prior to slicing. 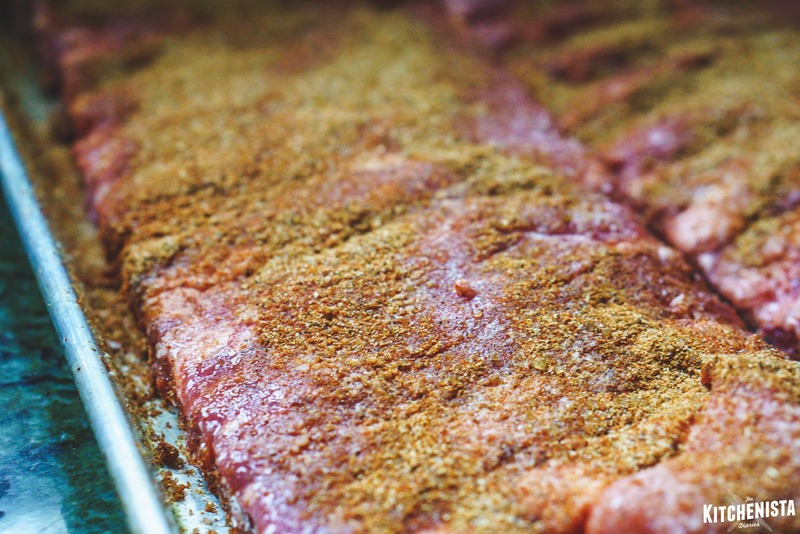 For the "dry" ribs, don't forget to dust the slices with some of the dry rub prior to serving! For the "wet" ribs, serve the extra sauce on the side if you'd like. I was always under the impression that ribs needed to be falling off the bone tender. Only in recent years have I seen the light though, and agree that those ribs are actually overcooked. I prefer a little chew left. Fatty and tender and the slightest tug needed to pull the meat off the bone with each bite. I couldn't decide if I enjoyed the dry ribs or wet ribs more, so I'll leave the verdict up to the reader! 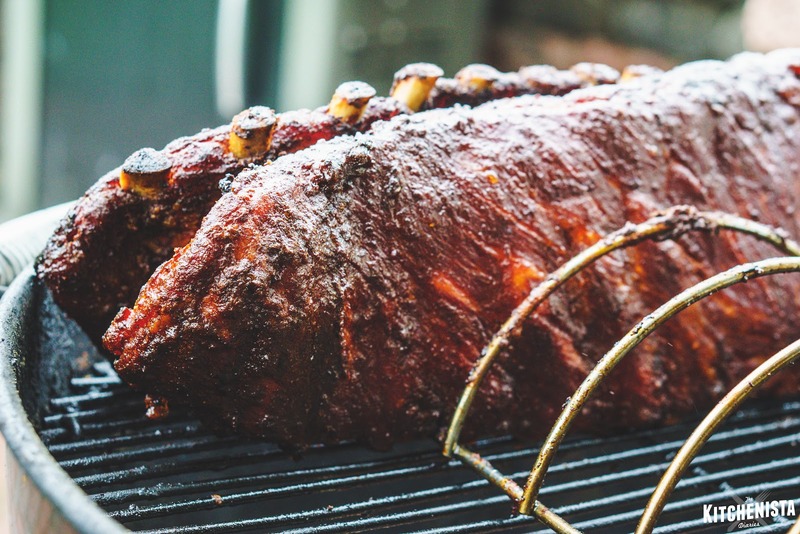 There's simply no comparison to the complex layers of flavor you'll achieve by taking the time to tenderize a rack of pork ribs in a grill or smoker. Your main job is maintaining the grill's temperature for the long cook time. That's the part that can be challenging if you're new to grilling. For this reason, it's important to have a pretty good feel for your equipment, know how to adjust the vents to control the flow of air, and of course be comfortable lighting charcoal safely. 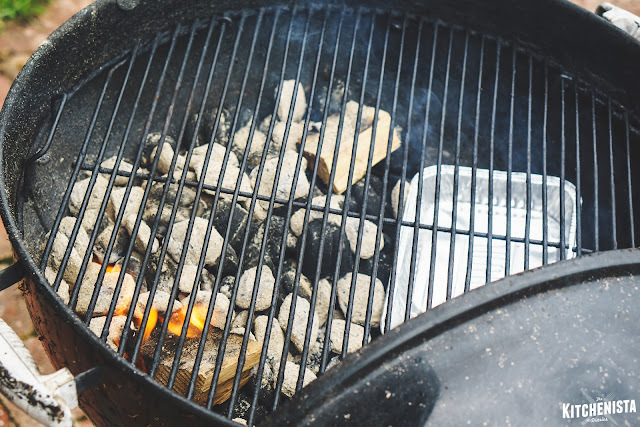 There are some amazing free resources out there on the internet if you're looking to take your grilling skills up a notch. Unless you're a bonafide pitmaster, there's most likely regional variations or new and improved techniques you haven't tried yet. 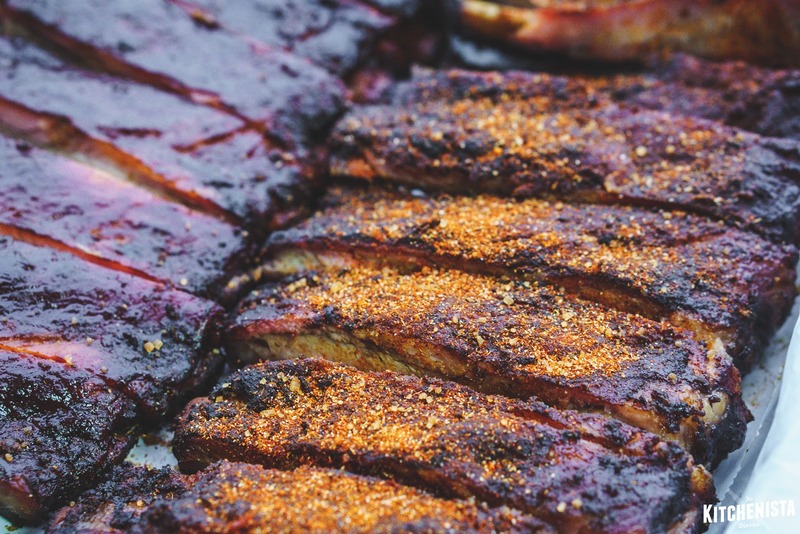 I won't be abandoning my signature coffee rub & cherry bbq sauce combo just yet (read: ever.) However, thanks to giving the Memphis ribs method a try, I'm really excited to play around with mopping sauces for my own formula. For more info on the #smallbutpowerful Tide PODS® solution, visit Tide on Facebook or Twitter! Every now and then I need an easy button. 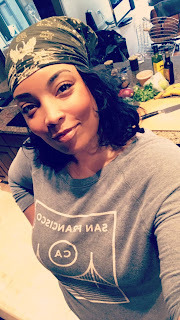 Between working on ebooks, deadlines for contracted recipe development and cooking for my client during the week, I am often feeling rushed or too worn out to do a whole lot in my free time. Having all this work coming my way is a great problem to have, it just means I need to get a lot better at managing my schedule now! Part of that means figuring out ways to cook for special occasions that are less of a time commitment than I'm used to making. A great example of this came up last month on Easter Sunday, when I volunteered to prepare dinner at a wounded veterans' retreat in my town. (It was an amazing experience personally and professionally, so more on that in another post!) With most of my day committed to working somewhere else, I wanted to whip up something for my family for brunch instead of a traditional holiday dinner. The thought literally came together the night before as I was doing some last minute shopping for the catered dinner. 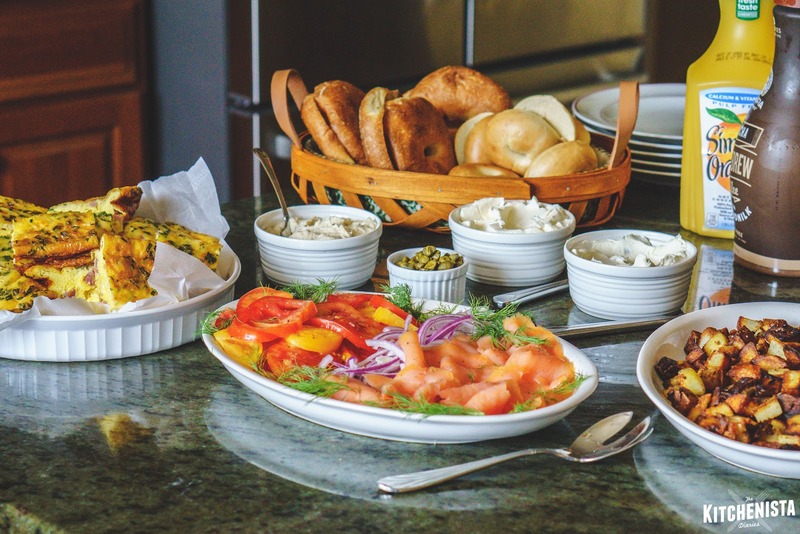 I needed to choose a brunch menu that wouldn't require overnight prep or creating a big mess in the kitchen since I would only have a couple hours in the morning to pull it off. I picked up ingredients for a classic bagel platter with a couple different cream cheese flavors, smoked whitefish spread, smoked salmon, fresh tomatoes, red onions, capers and dill. To round out the meal I did a very simple ham and chive frittata and some crispy duck fat roasted potatoes. It turned out to be a beautiful spread that had a little something for everybody's taste buds. The dishes took about an hour to make and plate, giving us plenty of time to sit down as a family before I had to get started on my work for the day. It was such a simple menu compared to the kind of thing I probably would have attempted had I had a whole day to plan, but it was an "aha" moment for me in realizing that sometimes less is more. Everybody was happy, full, and I didn't have to stress out or spend a lot of money to make that happen. 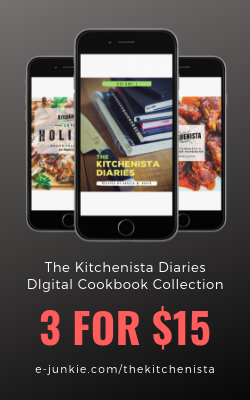 It gave me a ton of ideas of ways I can streamline brunch menus for my private chef opportunities too, which is always a good thing. The second "aha" moment came after I got home that night from work. I had a successful dinner but was completely exhausted from the whole weekend, which had also included some belated birthday festivities. My family had gone out to eat for Easter dinner, so there were no leftovers to dig into...womp. But, there was a little bit of smoked salmon left from brunch which I had tossed in a tupperware container with the remaining tomatoes, onions and capers. 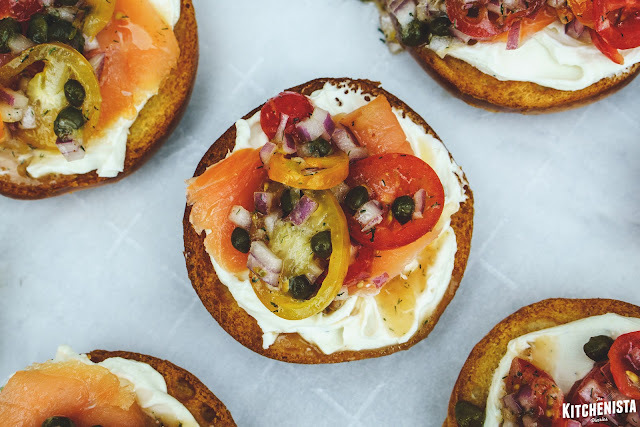 I grabbed half a bagel, slathered it with jalapeno cream cheese and just piled the leftover smoked salmon "salad" on top. It was so ridiculously perfect and even better than what I had eaten that morning. It wasn't exactly an innovative combination, I mean these are classic bagel toppings. 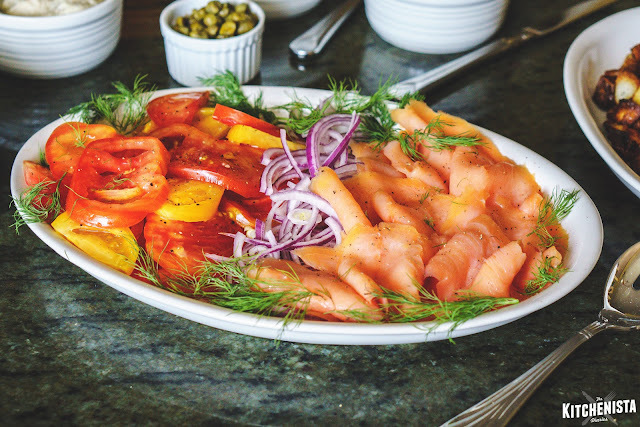 But the way the juices from the tomato combined with the caper brine and essentially pickled the onions as it all marinated... listen. This was definitely a better version of something that is already a good thing. It reminded me of bruschetta a little bit. 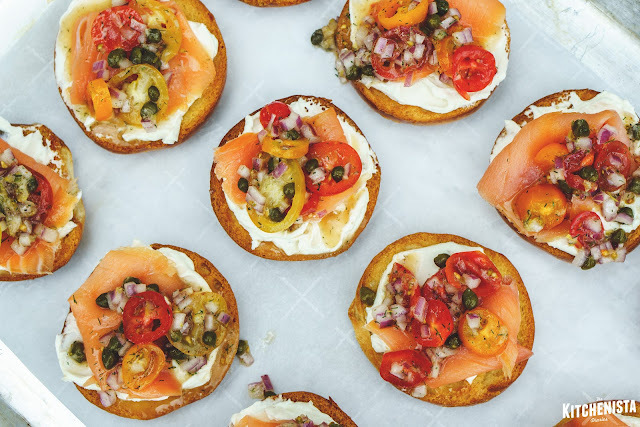 I was drawn to how fresh, flavorful and simple it would be to make mini versions of my bagel as crostini for a brunch party. So that's how this recipe came about. The best part of it is that there is no real cooking involved, just popping a pan of bagel halves in the oven to toast. The tomato relish can be prepared a few hours ahead of time, and would actually be even better that way so I encourage it. 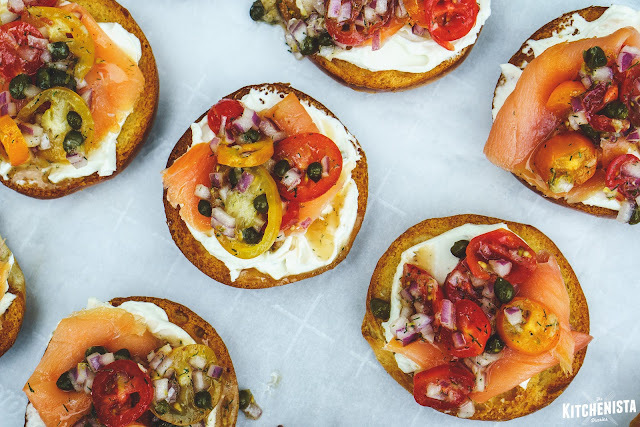 This would make a fun appetizer for a spring or summer brunch, such as Mother's Day which is right around the corner! I recommend taking advantage of the heirloom tomato varieties coming into season now which come in a range of vivid colors. Also, I would not judge you at all if you made a tray of these for yourself, so no party is necessary as an excuse. They're that good, that easy, and you deserve! Preheat your oven to 400°F. 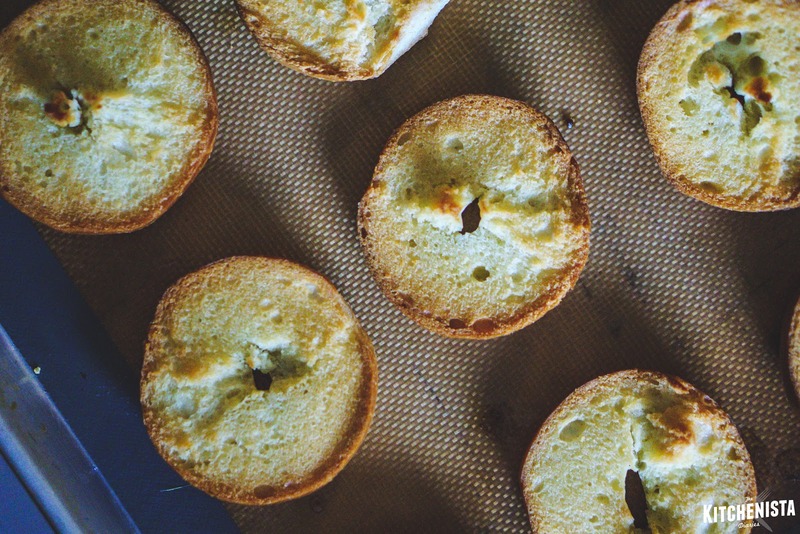 Split the bagels open and arrange on a lined baking sheet. 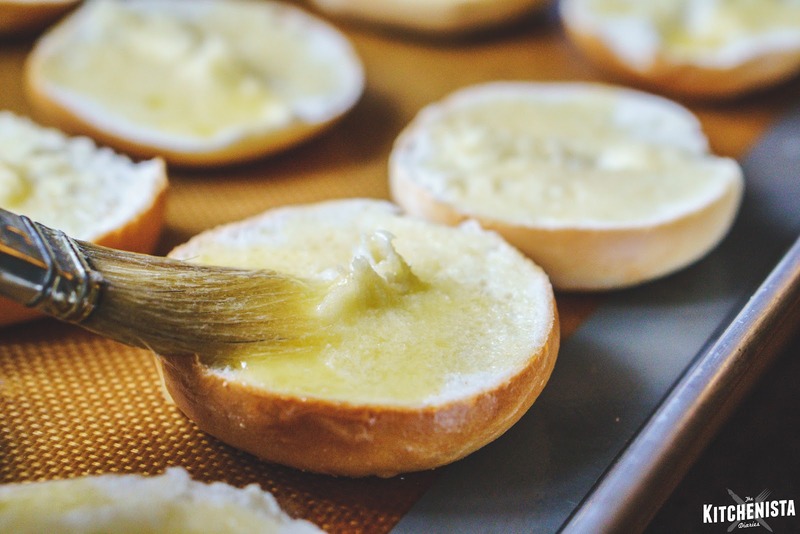 Brush each bagel generously with melted butter. Toast the bagels on the middle rack for 10 minutes, or until golden brown, then set aside. Ovens vary widely so keep an eye on them to avoid burnt bagels. This step can be done ahead of time, but they'd be best within a couple hours of toasting. Tomatoes can be thinly sliced or quartered for the relish. You'll need to use a pretty good paring or serrated knife to avoid making a mess of the skins. Switch to your chef's knife to dice those onions though. I got a brand new set of fancy knives as a gift recently and I'm always excited for the little prep steps now, ha. Combine the grated garlic (use your zester to grate it! 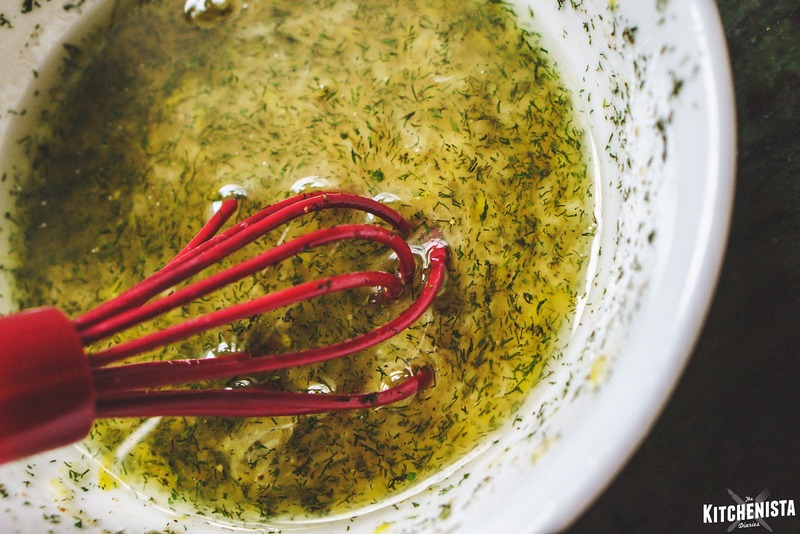 ), caper brine, lemon zest and juice, mustard, honey, olive oil and dill, whisking until you have an emulsified vinaigrette. Season to taste with salt and pepper. 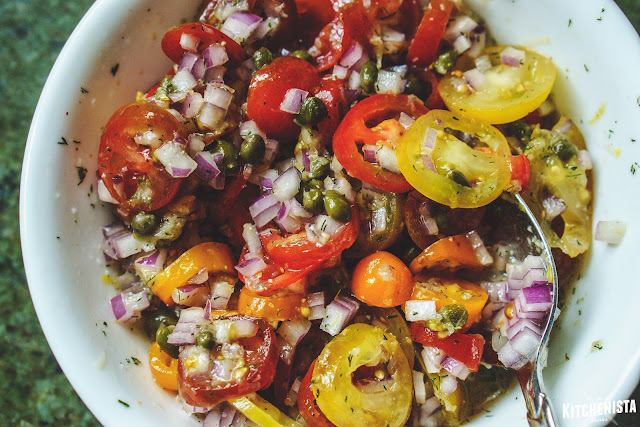 Toss the sliced tomatoes, capers and onions with the vinaigrette. This can be used immediately, otherwise refrigerate for up to a few hours in advance. 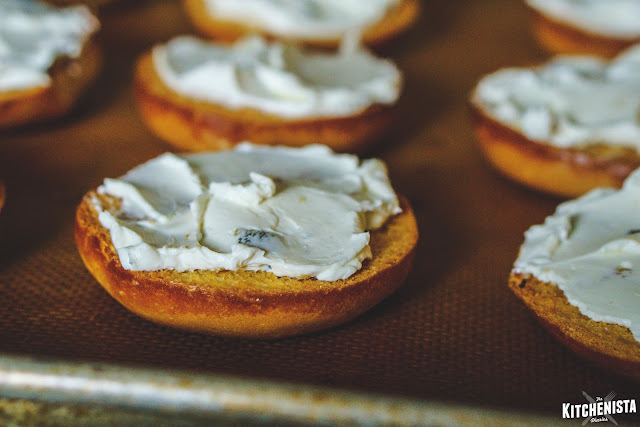 When you're ready to prepare the crostini for service, smear the bagels with a tablespoon or so of cream cheese. I opted for jalapeno for a kick, but plain would be fine. Chives would probably be my next pick for a fun variation! 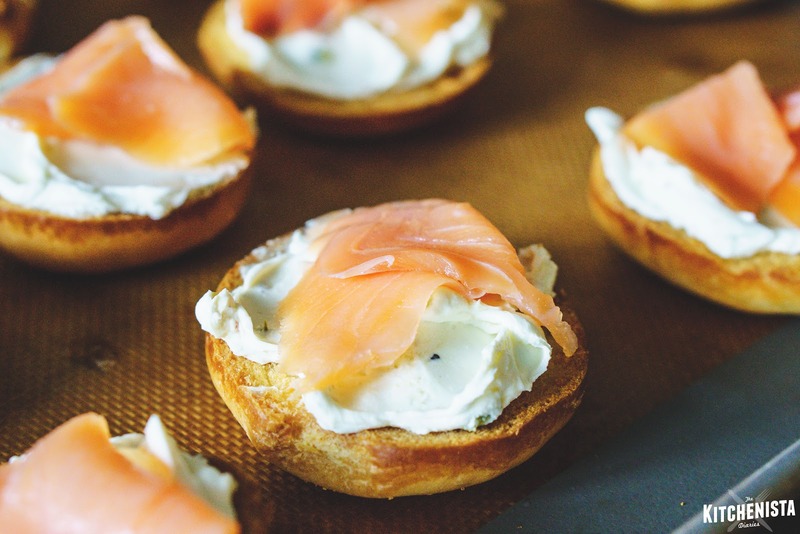 Now grab the smoked salmon, which is easy to tear or slice into smaller pieces. Fold a piece over each bagel. 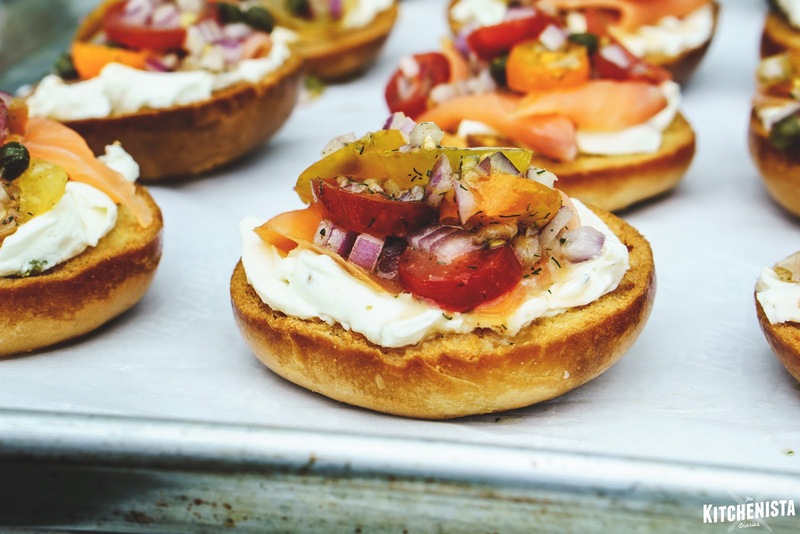 Finally, spoon some of the tomato caper relish over the salmon and cream cheese on each bagel. It's okay if it spills over the sides or soaks into the toasted bagel. These will taste and look wonderful look without needing to be perfect. I kept it simple and served these on a clean sheet pan lined with parchment paper. 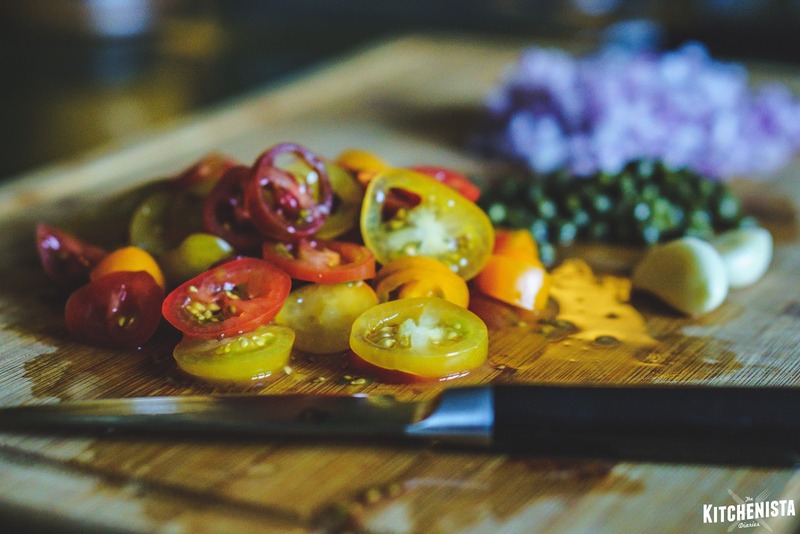 Another option would be a large wooden block cutting board, or get out your favorite serving platter. Told you this one would be easy! 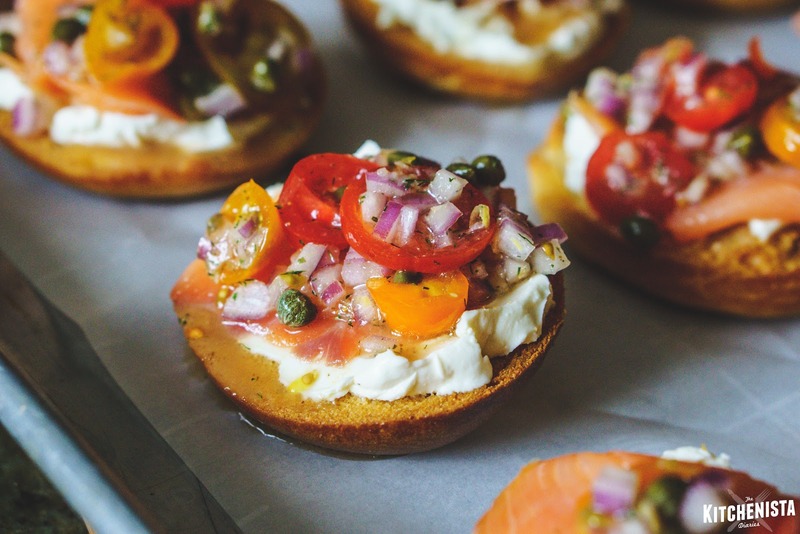 You don't need to be an experienced cook to pull off this appetizer, but your guests will be impressed nonetheless. I hope you enjoy and find a way to make these a part of a special occasion at your home in the near future!